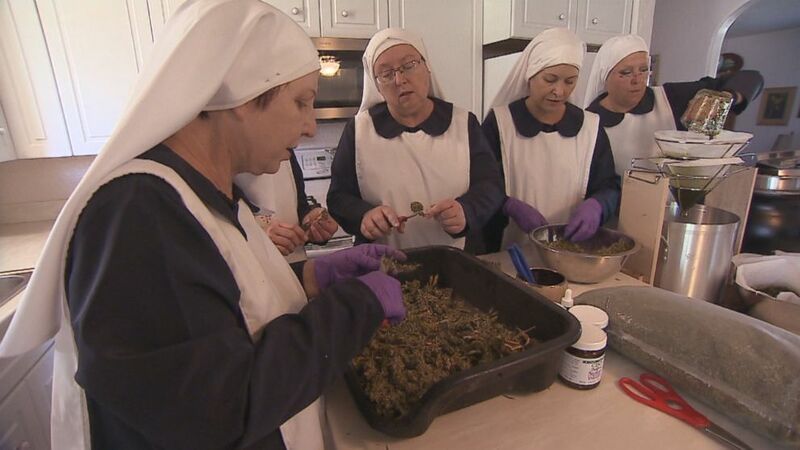 The Sisters of the Valley, a group of self-styled "weed nuns," are putting their faith in the healing power of cannabis. Despite their moniker, this nonreligious sorority of radical feminists resides in Northern California farm country. The women grow cannabis on the sun-drenched property, tucked among vineyards and apple orchards. They use a strain of marijuana that eliminates THC, but still contains CBD (cannabidiol), which is touted for its healing properties. "It's considered hemp because it won't get anybody high, but it's really marijuana," said “Sister Kate," whose real name is Christine Meeusen. "It's medical marijuana, but just like over the years they've been able to develop strains that get you super high. We've also developed strains that don't get you high at all." (ABC News) The Sisters of the Valley grow cannabis in Northern California farm country. The Sisters of the Valley sell products for various ailments including insomnia, arthritis and anxiety. Their top seller is a tropical salve that soothes achy joints. That product alone rakes in $3,000 per day, according to Meeusen. (ABC News) The Sisters of the Valley top seller is a tropical salve that soothes achy joints. A few of the women live on the compound, and six of them work on the cannabis business, along with two "Brothers." "We do need men and we don't want to be exclusive of the men," Meeusen said. "We just want the women to own the businesses and hold all the offices in town." Meeusen is the matriarch-in-chief at the Sisters of the Valley. The divorced, former marketing consultant raised two children and said she had to start from scratch after her marriage came apart. She said her company grew out of the Occupy Wall Street movement and a desire among her and her peers to build their own commune in an environment that allows for "healthy socialism." "We believe in paying taxes," she said. "We believe quite frankly that America's culture of starving the tax system is wrong, it's morally wrong. Most of us have lived in other places where the tax system actually works." Meeusen said she lived and raised her children in the Netherlands, which has universal health care. "Fifty percent of income [in the Netherlands] is paid in taxes," she told "Nightline." "But guess what? They never pay a hospital bill. They never worry about their retirement or being homeless," she said. "So yes we are very very for a reasonable sort of socialism and that is paying your taxes and taking care of the marginalized." We are on a mission to empower women to be their best spiritually, to be their best as an activist and to be in service to their own people and the planet. So we're out to inspire women. 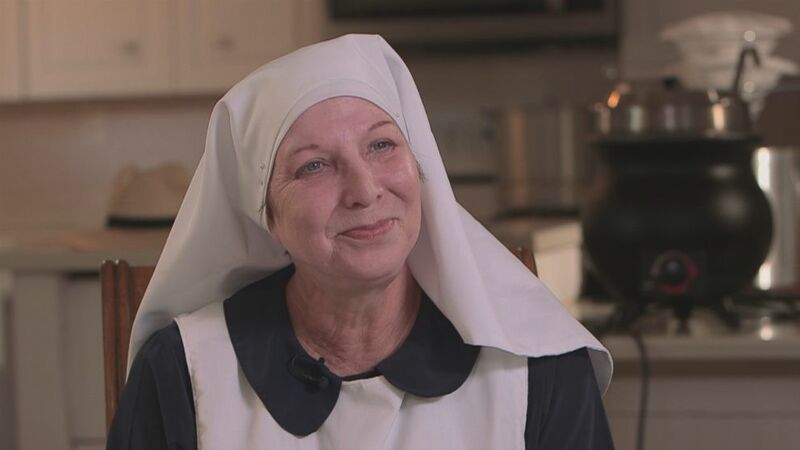 (ABC News) Sister Kate of the Sisters of the Valley is seen here during an interview with "Nightline." Unaffiliated with any church, the Sisters of the Valley wear habits around the property, but Meeusen said she doesn't feel like they are making a mockery of religion. "Religion [has] made a mockery of itself," she said. "We didn't have to help them." Sister Sierra, aka Sierra Walker, said that this group of women who live, work and pray together "are truly sisters, truly nuns" in that definition. "We give our hearts and our minds and our souls to what we are doing here," she said. "And I think that we're doing a good job," she said. "I think we're doing a marvelous job, and I think the revival that we needed in our world." Walker said she is a new acolyte to the group. "I think as I grew older I came to see things differently and cannabis has been very much on my heart as a healing," she said. Meeusen added that they all took vows to live simply which she explained is different from a vow of poverty like traditional nuns. "We do take six vows, we take vows service, of activism, about chastity which requires privatizing our sexuality," Meeusen said. "It doesn't require being celibate but it does require keeping it very private off the grid. We have a vow of living simply which -- speaks for itself." (ABC News) The Sisters of the Valley said they raked in $1.1 million in profits last year. The sisters said they produce a line of "medical-grade products" on the farm that requires them to wear headgear while handling the crops and oils for hygiene purposes. While they do grow their own cannabis, the sisters also ship in some product from Oregon. "Generally, people use CBD for chronic pain, also it’s good for insomnia, anxiety, depression," said Sister Alice, aka Alice Fullerton. 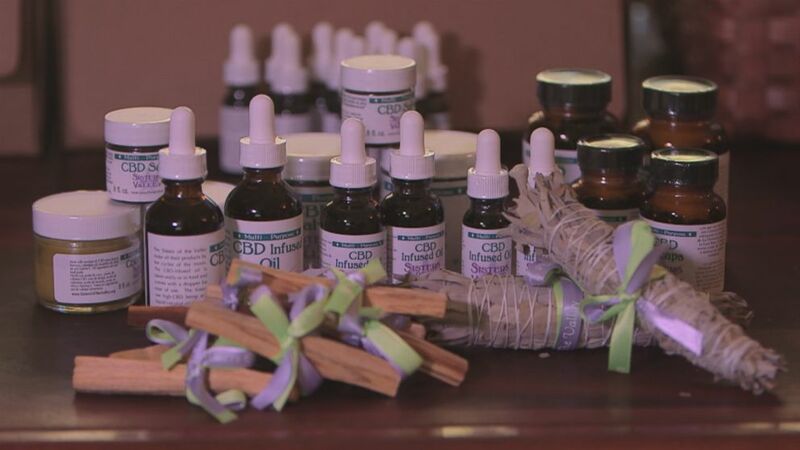 CBD products have grown in popularity more recently and are now widely available in 31 states that have public medical marijuana and cannabis programs. Recreational marijuana is legal in nine states and the District of Columbia. There are even coffee shops in Los Angeles and New York City that offer droplets of CBD product. According to Forbes, Coca-Cola is also considering adding a CBD beverage. The booming realm of hemp-derived products is expected to be a $2 billion industry by 2022, according to new data from New Frontier Data. The Sisters of the Valley said they raked in $1.1 million in sales last year. "With a just distribution of Mother Earth’s gifts, no one has to live in poverty," Meeusen said. "We're activists for the $15 minimum wage. We're not going to invest our money in ostentatious wealth when we could be creating jobs for other women. That's the goal." When they aren't making their producers, the Sisters of the Valley live as others do. They surf the Internet, watch YouTube videos and smoke the occasional afternoon joint. The women said their lives are not dedicated to the herb, but to the idea of sisterhood -- a women-owned and operated business that nurtures others as well. "We are on a mission to empower women to be their best spiritually, to be their best as an activist and to be in service to their own people and the planet," Meeusen said. "So we're out to inspire women."